Lovin The Life I Color: I DO LOVE my birds!! I DO LOVE my birds!! It rained most of the day yesterday and I was lucky enough to get a shot of this just before the sun went down.....I am loving my photo's taken outside they just turn out better. Here is a card I made yesterday with a few of my new stamps. I have not stamped the wording on the inside as of yet.... Hope you enjoy. and they certainly do LOVE you back! Love the big sunflowers.. they fit so perfectly! I love yor birds. Just STUNNING. Everything about this screams "Kelly" and "cute". Now I HAVE to have those stamps. You are amazing Kelly. Kelly, I just can't say enough how I LOVE what you're doing with these birds! It's like they were totally made for you, girl! I'm working on a "Kelly Bird Card" - totally inspired by you. :) Hope to get it up soon. Now how cute is this? 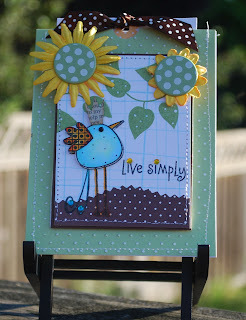 Love your birdie and those sunflowers are magnificent! This is awesome Kelly!! 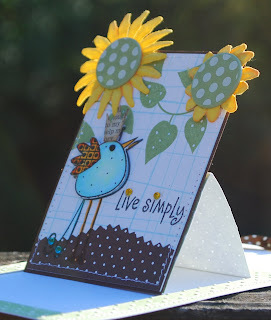 Your bird and owl cards are just fabulous, I can't get enough of them!! So cute. LOVE the sunflowers! That might be the cutest bird yet? I love how he's kind of animated looking. You are the bird whisperer.. :) Your coloring on these birds and how you deck them out is fabulous! Talk about cute! I love it!